How do i change the destination of my wearQR product? what should i do if i lost my QR edit page? can i protect my edit page with a password? what applications are supported by wearQR? How to scan the QR? 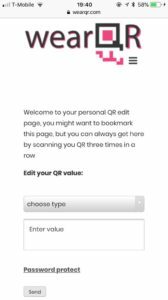 the wearQR products are made from high quality long durability materials, and can be scanned in IOS 11 build in camera, chrome built in QR scanner, or any other QR scanning app.